“Open the door on tomorrow!” shouted the ads. “Eyes widen, hearts quicken at this dream come true” claimed the sales brochure. With all-new body shells and the hemi V-8 bored out to 270 cid, the 1955 Dodge Royal improved on the prior 1954 cars by being wider, longer, lower, and more powerful. The wheelbase was stretched to 120 inches from 114 or 119 inches in the 1954 models, which gave Virgil Exner plenty of room to work a fabulous design. The modest six cylinder engine was boosted for a second year in a row, from 110 hp to 123 hp – a 20 hp increase in two years. The V-8 engine’s additional displacement added as much as 53 hp. A new top-of-the-line Dodge Custom Royal entered the lineup with a more powerful standard V-8 and additional trim. The car also carried small “fins on top of fins.” Both Royal and Custom Royal models could be ordered as two-door Lancer hardtops and four-door sedans, while the Royal also had a station wagon and the Custom Royal had a convertible and hardtop sedan. Tri-color paint schemes were popular and eye-catching for both models. More improvements for the Dodge Royal in 1956 included a new face, modified trim, larger fins, more colors, altered taillights, and a new stroked hemi V-8 that now displaced 315 cid. In addition, the Powerflite automatic transmission now had push-button selectors. The most powerful Dodge passenger car engine was the D-500 V-8, which used dual four-barrel carburetors to produce 260 hp – an increase in one year of 67 horsepower. In order to accommodate the additional power, a heavy-duty suspension was included with this motor. One of the most interesting Dodges of the 1950s was the “La Femme,” which was available on the 1955 and 1956 Custom Royal Lancer hardtop coupe. The La Femme was marketed specifically for women. Factory extras included a pink and white color scheme (1955) or lavender paint (1956), special color-keyed upholstery, a cosmetics kit, a raincoat and cap, a matching umbrella in a special storage compartment behind the front seat, and more. Few of these cars were sold, which makes them particularly rare and desirable today. A similar Texan Lancer model was also sold in Texas and surrounding states. 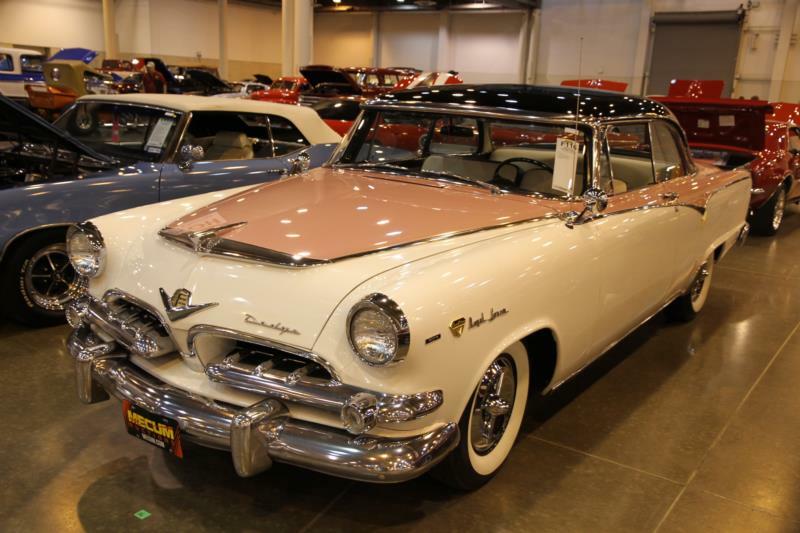 Today, the 1955 and 1956 Dodge Royal and Custom Royal are terrific cars from mid-1950s Americana. The high-horsepower cars are particular fun to drive, and all of the models have a more subdued look than the next generation Dodges, which some buyers prefer.